This Lakeside 992 stainless steel Adjust-a-Fit heated two stack plate dispenser is the perfect solution if you wish to dispense oval plates or platters in either a back of the house or front of the house setting. 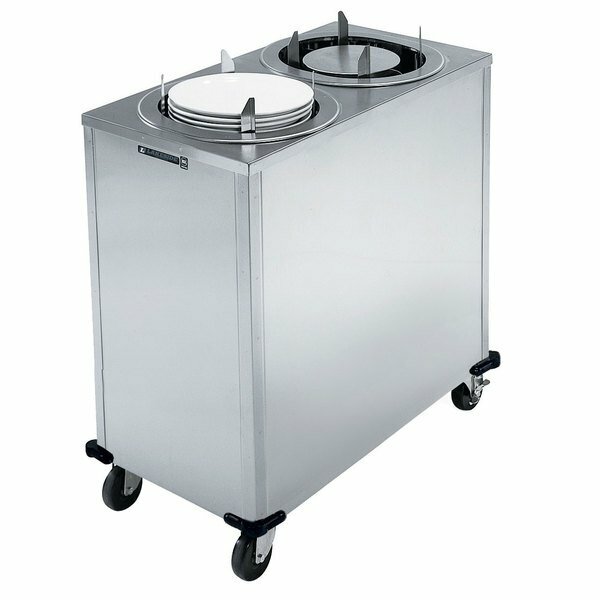 This dispenser can handle oval plates 8 3/4" x 9 3/4" to 11 3/8" x 13 1/2" in size and easily adjusts both in height and diameter without the use of tools! Made of easy-to-clean stainless steel, this plate dispenser ensures that your plates or platters are kept in a safe, sanitary environment within easy reach. The all-welded construction of this dispenser provides increased durability and stability, especially when transporting plates from one location to another. The four 4" all swivel casters, two with brakes, allow for easy maneuverability, even with a full load, and lock in place to keep your dispenser secure. This heated dispenser features individual thermostatic controls for each stack that are easy to adjust, ensuring that your plates are kept at the perfect temperature. With a temperature range of 100 - 175 degrees Fahrenheit, this dispenser provides an average 40 degree Fahrenheit rise in plate temperature over one hour at the middle temperature setting. This unit requires a 120V, 900W, 7.5 amp electrical connection.